Americas Cardroom and the Winning Poker Network are at it again, running an OSS Cub3d tournament series, the seventh to appear at the network. This time, the prize pool guarantees top $8 million, spread across 169 events. The fun begins Feb. 10, 2019 and continues through March 10. As befits the “Cub3d” part of its name, the OSS Cub3d is actually three series combined into one. First, there's the MOSS (Mini Online Super Series), consisting of 48 tournaments with buyins from $0.06 to $215, running from Feb. 10 to Feb. 17. Then the OSS proper (Online Super Series) begins immediately thereafter on Feb. 18, and it proceeds until March 3 with 96 events denominated from $1.10 - $1,050. Then it's time for the high-rollers to clear their schedules for the BOSS (Bigger Online Super Series), which fires off March 4 and terminates March 10, boasting 25 MTTs with entries priced between $109 and $2,100. It's pretty rare to find good spots for seven-card tournament action, especially in the U.S.A. online market, but that's exactly what this tourney provides. Join in whether you play stud as your main game or just as a change of pace from your normal routine. The answer to life, the universe, and everything may just be event #42 on the MOSS roster. Pay only $88 to compete for your share of $300,000. This represents less than half the buyin of the normal Sunday Special weekly tournament combined with double the guaranteed prize pool. 6+ Hold'em is all the rage among the high-stakes community, and you can try your hand at it too. Actually, there are several other 6+ opportunities in this installment of the OSS Cub3d, but this has the most money up for grabs, so if you have to pick just one, it merits your serious consideration. It's back! The seven-figure Million Dollar Sunday was a fixture at ACR in early 2018, but it had be discontinued because the room was eating sizeable overlays almost every week. Now you can see what all the fuss was about and participate even if you failed to do so before though the buyin this time is higher than the $250 + $15 that it used to be. Another chance to play for your piece of $1,000,000, this one is for those who prefer smaller fields and possess the bankroll to afford the luxurious buyin cost. Hell, there's no reason not to play both this one and the $540 one if you can swing it. That way, you double your odds of scoring a big payday. We know what you want, you total degen: crazy PLO action with enough cash up for grabs to make it worth your while. This instance of the Sunday Special PLO has nearly double the normal guarantee while yet remaining at the same reasonable $215 price point. It runs at the same time as the BOSS MDS, so you can play them both simultaneously – that is, if you can handle the madness of switching in real time between two-card and four-card poker. As you participate in OSS Cub3d tourneys, your performance will be tracked, and you'll earn points toward the series leaderboard. Actually, there are three separate leaderboards, one for each “sub-series”: MOSS, OSS, and BOSS. You'll get points based on your finishing position, the cost of the tournament, and the size of the field. The top three finishers in MOSS and BOSS along with the top four in OSS will each receive a $2,650 seat for the $5 Million GTD Venom tournament. The first-ever Venom will be held July 21 at 2:00 p.m. ET, and it will be the largest tournament in the history of the Winning Poker Network. The organizers of the OSS Cub3d have gone to quite strenuous lengths to ensure that there's something on the list of events for players of all financial circumstances. Nevertheless, they recognize that many users would like to play in tourneys for which they might be a bit short. Therefore, there's a full complement of qualifying tournaments in the lobby. You can win your way into a large OSS Cub3d competition for as little as $1.10! If you wish to replenish your account balance, you can get a reload bonus. 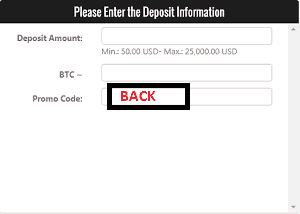 Simply type in the bonus code BACK when making your deposit between Feb. 17 and 23. 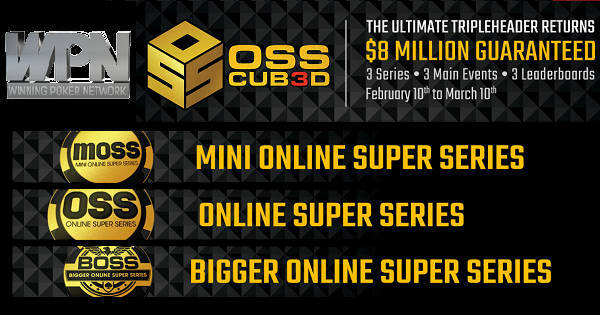 You'll receive 50% up to $300: a fine way to get a little rakeback when buying into the OSS Cub3d tournaments. In order to register for the OSS Cub3d and claim a piece of the $8 million+ at stake, you need to have an account at one of the WPN sites. We heartily recommend Americas Cardroom, which will welcome you with a 100% up to $1,000 bonus and $50 free credit upon your first deposit. Actually, through the use of our Americas Cardroom promo code PRB10FREE, you can get a complimentary $10 added to your balance with no deposit required. Read our Americas Cardroom review to learn more. There are several other rooms on the Winning Poker Network besides ACR. If you're interested in an alternate site, then you can read our reviews of BlackChip Poker, True Poker, and Ya Poker (non-US).